Ninja Theory has always been a favorite developer of mine. Between Heavenly Sword, Enslaved: Odyssey to the West, and even DMC, I never found a game from them I didn't like. Now that PlayStation VR is here, the ninjas have brought us DEXED. Does this rail shooter ignite your love for PlayStation VR, or is this idea better left on ice? Having played through it, I'm burning to answer that question. (Note: The fire and ice puns probably won't stop here, fair warning). This is Beautiful, But Why am I Here? If you've read my reviews, you know I love a good story. I also know that Ninja Theory is more than capable of telling a complex, interweaving, and satisfying plot. I was, admittedly, a little sad when DEXED didn't have an exposition to speak of, but for a $10 game, you can't expect a AAA budget. Despite the lack of any story, DEXED still pulled me right into its world. The elemental themed levels were an excellent touch and I felt like the environments were all unique. You don't interact with them at all, but they do provide excellent backdrops for the gameplay and have a nice sense of scale to them. There's a marked difference, for example, between the lava world and the snow one that goes beyond simple color palettes. The rhythm of the level changes as well. The lava world was frantic and exciting, while the snow world offered peaceful winter wonderland vistas. Small touches like targets appearing in the environment keep them from being pure set-dressing, but the majority of enemies will be flying all around you. 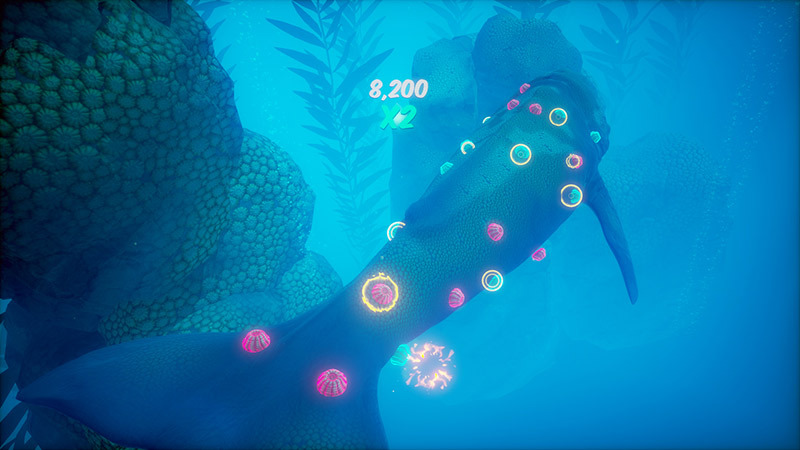 Beyond the game's four levels, you'll also have a showdown with an giant octopus that will test your reflexes and your ability to fire the correct element at its weak-points. While DEXED doesn't offer a story of any kind, the expansive and varied worlds will certain keep your attention while you manage the swarms of enemies. Of course, DEXED isn't a simple rail shooter. No far from it. In keeping with the elemental theme that DEXED employs, you'll also be fighting your enemies with fire and ice. The game can be played with two Move controllers or a DualShock controller. For the purposes of my review, I tried both. Fans of Rez, Ikaruga, and Panzer Dragoon will feel right at home with the red/blue palette of the game's elements. When you're using the Move controllers, they appear in the game as a flaming controller and a frozen one. You hold the trigger on the respective controller and paint your targets with the elements in each hand. When you release, bolts of fire and ice shoot from your screen and smash into enemies with a satisfying explosion. Of course, fire only damages ice and vice versa. 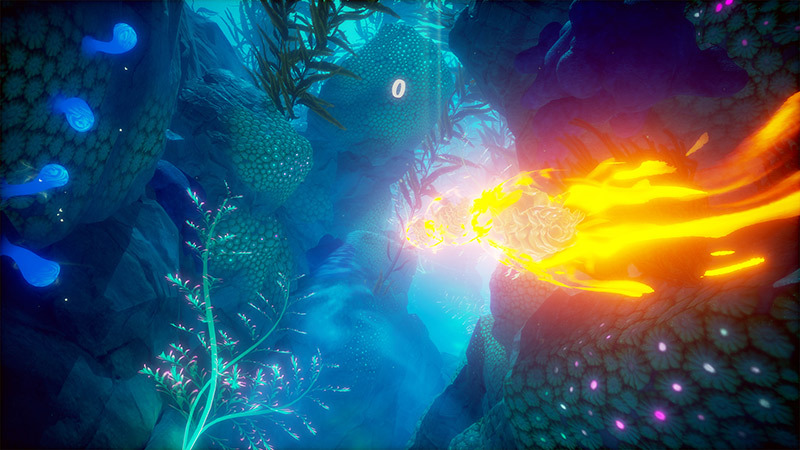 The game has four modes ranging from "zen" where you simply cruise through the levels free of enemies and enjoy the sights, to hard where every mistake you make will indeed cost you point. On the normal difficulty as well, when you hit an enemy or object in the environment with the wrong element, they fire a bolt back at you. Fire literally causes your score at the top of the screen to "burn" and you lose points. Ice freezes your score in place and keeps you from earning more points temporarily. 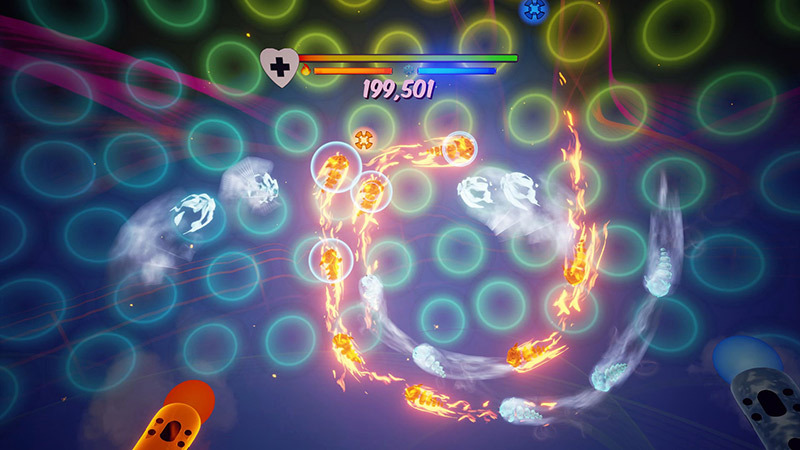 By holding the Move button on your controller, you can create a shield to block these incoming attacks, which can sometimes come at random as well. At first, getting your coordination can be difficult as you're trying to paint the right targets with the correct element. The responsiveness with the Move controllers is great, though I found myself having trouble tagging targets here and there when they were in a tight group. If you opt for the DualShock control scheme, the aiming is done with your head tracking (which is always extremely accurate), and you use the triggers on your controller to designate the element of your blast. There's positives and negatives to both control schemes, but once you've had some time with the game, you'll be able to coordinate your attacks. This is where the Move controls shine. If you're skilled enough you can independently tag enemies with each hand and rack up a huge score. And that's really the point of DEXED. This project, born from a game jam within Ninja Theory, is a score-based experience. You'll breeze through the levels pretty quickly, but if you put the game down after that, you're missing the point. 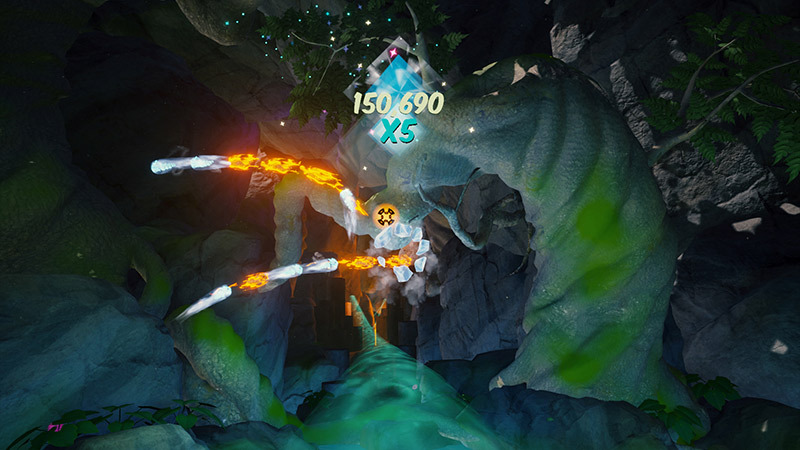 With leaderboards displayed at the end of each level, score is the motivator here. If you get tired of the rail shooting, there's always the arcade mode as well. More than just a simple add-on mode, arcade mode gives you a health meter and a new mechanic to contend with. Enemies enter the area in waves and you must get all of them before they leave, or you lose health. Furthermore, bombs will appear that can be detonated with fire. They'll kill the enemies, but they will also damage you if they're too close. You can disarm them, however, with a blast of ice and then fire. An AOE attack with the move buttons will also clear out the area if you get overwhelmed. Seeing how long you can last against the waves of enemies is excellent, and a nice change of pace from the rail shooting. DEXED is a wonderful looking game in VR. I was playing on PS4 Pro and I loved the bright colors and spectacular effects when you strike enemies. The games smooth and synthetic soundtrack also makes everything feel very relaxed, even when the enemies are bearing down on you. The electronic beats work extremely well for every situation. Which brings me to my final point. 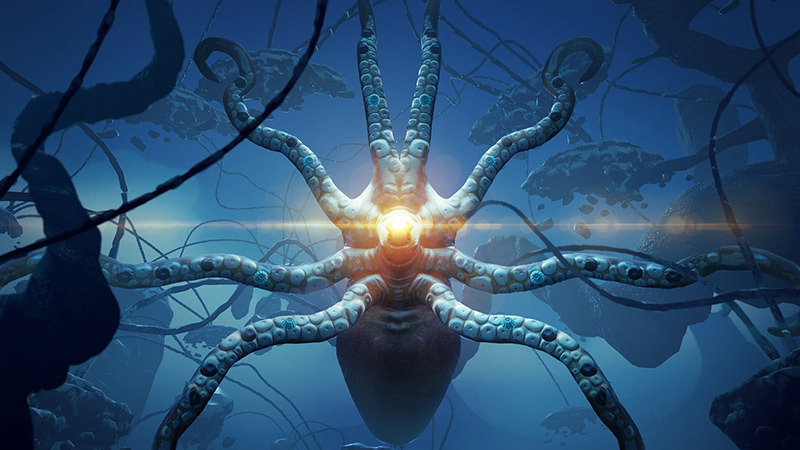 DEXED is a great game for your $10, and more than that, it's a VR experience that can be tailored to any skill level. Want to simply take in the sights? Zen mode has you covered. Looking for a light challenge? Try easy or normal mode. Want to be up to your eyeballs in explosions? Hard and arcade modes have you covered. It's a game for every skill level and every budget. It's also proof that Ninja Theory can rock a solid VR experience. Here's hoping they continue with this trend in the future. In the meantime, I'm going to master my ambidextrous use of fire and ice in VR, and you should too.